Remember back in the final AFDS 2012 keynote, AMD CTO Mark Papermaster said AMD will provide more information on their FirePro lineup during SIGGRAPH 2012? So this is really a launch, a big launch, as the lineup gets a top-to-middle refresh. The FirePro professional graphics lineup for 2012 consists of four members. Update 8/8/12: W8000 changes from 2×8-pin to 2×6-pin. Thanks to Arvid for the correction. Explanation: The train wreck that is AMD PR is to blame for this with seemingly new lows every day. Same for all GCN-based GPUs, all these professional graphics cards support AMD Eyefinity technology for multi-display workloads, and DirectX 11/OpenGL 4.2 APIs as well as OpenCL 1.2/DirectCompute/C++ AMP. Genlock and framelock functionality will be provided by the FirePro S400 synchronization module, as per usual. 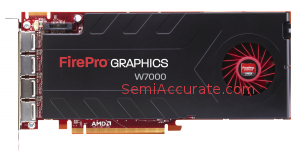 Power efficiency is also important for professional graphics and GPGPU parts as they contribute significantly towards the stability of the product, so the usual AMD PowerTune technology and AMD ZeroCore technology are present in all of the above FirePro offerings, the same for the use of vapor-chamber fansinks. So where did the low-end refresh go? Here is a little hint, and so as here.